There was no elf costume this year, just a sparkly new 5k PB for me at the Team Naturally Run Christmas race! 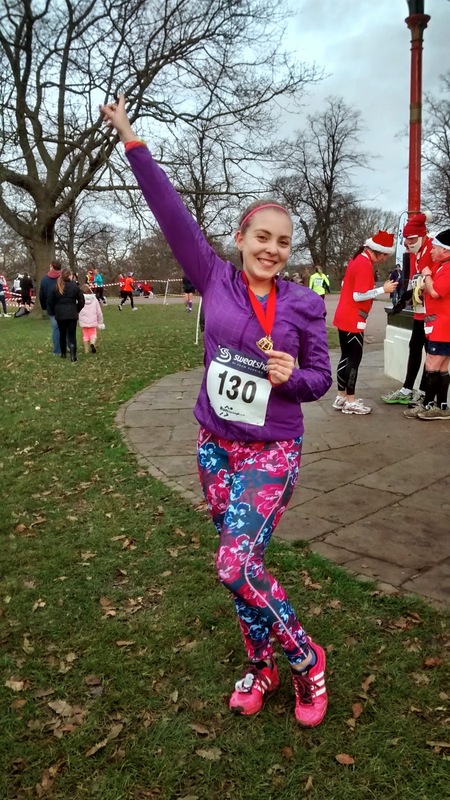 We’d chosen the Run Through Greenwich Park 5k (or 10k) as our annual gathering, and some of the girls had definitely gotten into the festive spirit, with trees to add to last years elves! 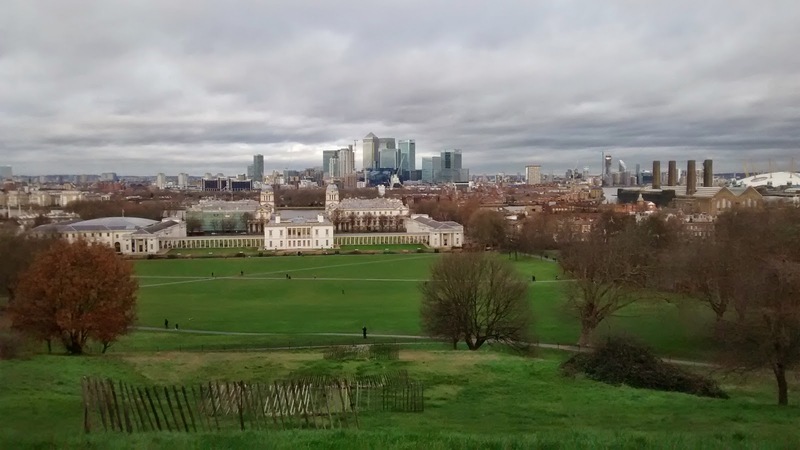 It was a pretty grey and windy morning, and we sheltered in the nearby Pavilion Cafe in Greenwich Park after we’d collected our race numbers, before dropping our bags in the bandstand and heading to the start line. I’ve been following a training plan for Brighton Half Marathon devised by my coach, Bea, which has seen me add intervals, and tempo runs to my running for the first time ever. This 5k race was supposed to be a tempo run, trying to beat my (really old) 5k PB of 34:21 set at Bushy Park parkrun last year. 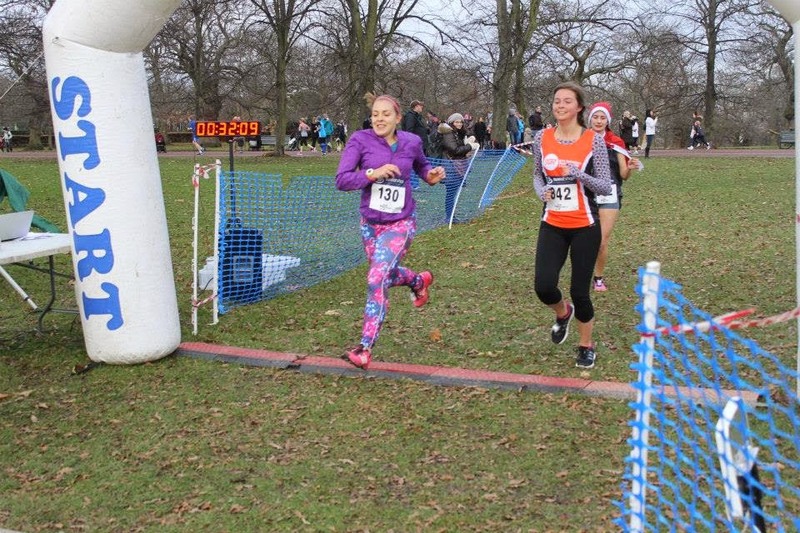 I didn’t really think this was the occasion to do it, and had in fact already drafted an email to Bea updating her on my training so far, and explaining that with it being a “festive fun run” and adding the hills in Greenwich Park I hadn’t managed to do it. I clearly need to have more faith in myself! Yes, the course was “undulating” to say the least, but with the steep uphills there were also fun downhill sections where I let my legs fly. I was rocking my newly purchased Sweaty Betty Zero Gravity Run Tights in a super bright floral print, (which I got a lot of lovely comments about!) and felt great! 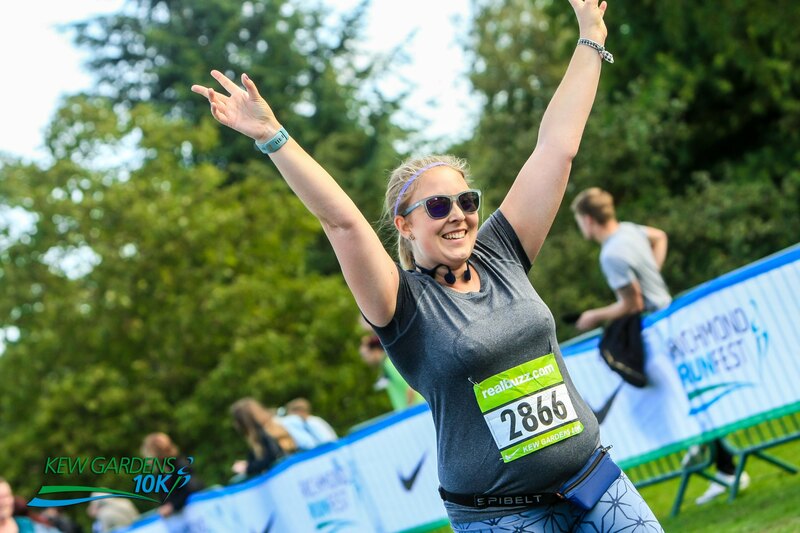 There were lots of people dressed up, chatting and running with friends and family (and dogs) and I felt a little antisocial to plug in my headphones and focus on myself so much, but I was determined to give it my all even if that didn’t mean a PB. There was an evil long hill just before the finish and my calves felt like they were on fire- obviously more foam rolling and stretching required- but I managed to round the corner and sprint across the line not even daring to look at my watch. When I did glance down, as Emma came rushing over to see how I’d done, I was absolutely staggered to see a time starting 31 something on the screen! My official chip time- 31:31 – well, I like to be neat. And what I love about being a part of Team Naturally Run, as well as all the congratulations I got on a great time, regardless of when people finished, we all stood and clapped and cheered each other over the line. Everyone finished with a huge smile on their faces! I will be posting an “end of year reflection” post, but I’m continually surprising myself with what I’m capable of and how far I’ve come. And I’m loving having these awesome ladies alongside! Have you ever surprised yourself in a race? Do you love or loathe hills? Congrats on a great PB! Love your leggings too! Thanks Emma 🙂 The leggings have really grown on me- such bright colours and patterns are really cheering in the winter! Well done on your PB again! It was such a tough course! Well done on your pb! I have only walked through that park but it is pretty steep so running though it must be very tough indeed!